We know the scene; there is a gathering, and someone is telling a story. We do not yet know whether these people gathered together form an assembly, if they are a horde or a tribe. But we call them brothers and sisters because they are gathered together and because they are listening to the same story. The gathering is that of the undocumented; a mass gathering of ten thousand at the Calais Jungle – the migrant camp at Jules Ferry, itself a long abandoned children’s holiday camp just outside Calais, France. The story common to each of the ten thousand is the struggle for rights in displacement. Jules Ferry was destroyed by the French state in October 2016. This essay is a recovery of the Jungle there through a remembrance of it as a community. It is an attempt to resist a second effacement of the Jungle through any story other than an affirmation of community, and it is a reminder of the urgency of retaining community in displacement in our historical moment. According to the UNHCR, about 14 million people were forcibly displaced in 2014. Overwhelmingly this displacement occurred in the Middle East and Africa. It is a scale of displacement we have not known since the Second World War. To get a measure of the number displaced at Calais, you would climb the mound at the heart of the Jungle between the Sudanese quarters, the fenced-in Container Camp, the volunteer Belgian kitchen and the Afghan encampments. From this vantage point, you would look upon those gathered in the magnitude of all its horrors. But the Jungle was never just a gathering of dispossessed humans. It was a gathering of political agencies. To have been there and to be a part of its life was to witness the making of a radically transversal community: a community beyond borders, a common project that was the conduit for diverse forms of civil agency. By community I am referring to the means by which humans, each in their own way, come together to be in common. In reading the Jungle as a community, I draw upon the writings of Jean-Luc Nancy, in particular his essay “Myth Interrupted” from his compilation The Inoperative Community (1991). At the core of Nancy’s work is the subject of community in modernity. For Nancy, a modern community cannot be identified as a homogeneous being. Rather, community is a state of being in common. Being in common necessarily places us outside form, identity, or place. Nancy’s writings reinforce the challenge that community in modernity can only be found in relation; that if it seeks closure in the one thing, a common being, it loses being in common. A key question for us today is how such conceptions of community contest parallel narratives of community unleashed by 21st Century nationalisms. The political antagonism posed by community — in particular the struggle through it for agency beyond the framework of liberal democracy — now underwrites all political life. The terrain of new struggle is being fought through myth and community by which the ‘powerless’, the ‘people’ recover their agency. As Nancy writes, myth engenders community, myth is myth of community. “Myth Interrupted” describes the conflict of a modernity that no longer lives in myth: in its attempt to build itself anew on the ground of myth, modernity condemns itself to “infinitely (self) communicating the story of its inauguration,” to “its perpetual representation of the compulsion to return to its own sources in order to re-engender itself from them as the very destiny of humanity.” Nancy draws out the bind of modernity, as a conflict of “myth cut off from its meaning by its own meaning.” It is through this ontological split that we can begin to see the unfolding conflicts by which elemental forces of myth now fight over community. Within this, the Jungle as a new political subject takes its place at a new intersection of inauguration, myth, modernity and community. A recovery of the Jungle as community brings a new dimension to the terrain of struggles experienced by those who are displaced. The Jungle’s own history began at Calais two decades ago. 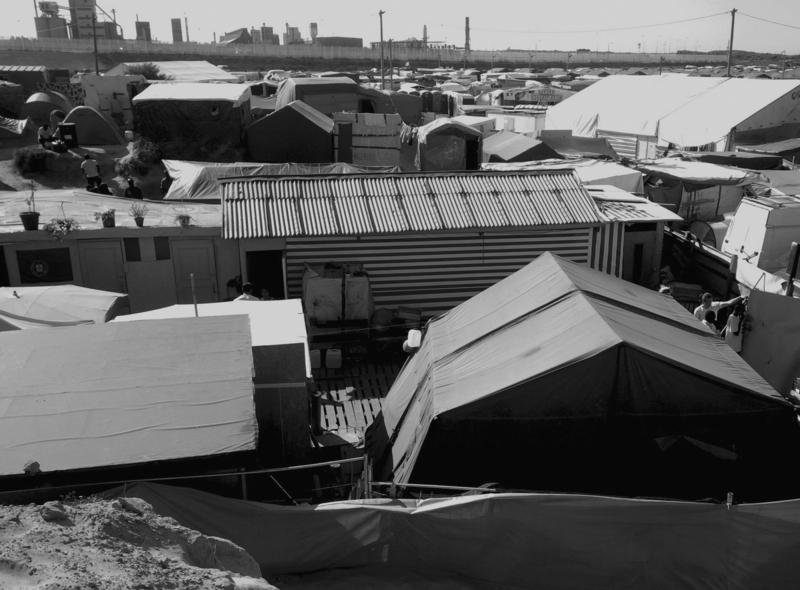 While the term “Jungle” referred to the precarious shelters of the undocumented migrants who came to Calais for the sole purpose of reaching England, it came to symbolize the guerrilla existence and resilience that enabled migrants to survive the punitive regulatory violence meted out by the state each and every day. As a clandestine subject — physically located in disparate places — the Jungle connected with long established European activist groups such as No Borders. In 2014 came a seismic change of scale. First, the numbers arriving at Calais increased many fold. Then the disparate jungles were uprooted and dumped at a deserted place at Jules Ferry. There the Jungle became the subject of a far broader public consciousness. Its accrued means of resistance fused with the humanitarianism of a pan European refugee crisis. At the same time, the solidarity of anarchist subcultures combined with the voluntarism of social movements that mobilized through social media. What resulted was an aggregation, both in the real world and in virtual networks. Out of this came a revitalized politics, a common project of community. Within this common project there were unsettled questions of identity and purpose: the Jungle could never be a homogeneous subject. This was illustrated by the L’Ecole Laique du Chemin des Dunes — the school set up by former migrants at Jules Ferry. Starting with its mission of education beyond borders for children at the Jungle, the Ecole mushroomed within a few months. There was no curriculum. All one had to do was to set up a desk and a classroom would convene. Soon the Ecole with its language classes became a place where migrants could get on the first steps of the ladder to overcome the sense of alienation and rejection in France. It was an affirmation of community as being in common. The Ecole attempted to rename the Jungle The Forum to gesture towards an identity more in line with Paulo Freire’s ethos of emancipation through education. But for the stateless, the Jungle’s identity was a part of their capacity to survive, a process of continual making and un-making. The Jungle at Jules Ferry, irrespective of its scale, grew out of that. And the Jungle prevailed. But within its complexities, as a vast Jungle with its thousands, it came to occupy a parallel space as a viral media subject. There it was too easily amplified. The Jungle became a mythic subject above and beyond what it was. But beyond the self-perpetuating narratives, much of which served the reactionary imagination, it’s worth drawing out a few key points. First, its making. The Jungle at Jules Ferry was the result of the coordinated response of the French and British states to the increased numbers of displaced peoples arriving at Calais in 2014. If their numbers represented only .0005% of the globally displaced, or .005% of the 1.5 million arriving on Europe’s shores, the French authorities responded by evicting all jungles to Jules Ferry. The mega-Jungle replaced the jungles. This was not how Calais’s stateless peoples from very divergent cultures would have come together. Rather this was a forced gathering, a collectivization of the stateless by the French state (in concert with the British state). Second, its dismantling. Just as the Jungle gathering was collectivized by the state at Jules Ferry, so too was it dismantled by the state. The Jungle was an electoral liability that had to be erased from sight by December 2016 to prepare the ground for France’s presidential elections in 2017. The theater of its dismantling was a global media exercise, the significance of which can be read by the awarding of the Legion D’Honneur, the Republic’s highest decoration, to Fabienne Buccio the prefect of Pas-de-Calais for a job “well done.” However, if the objective was to manage the administration of human rights behind closed doors at locations far from Calais, a fifth of the Jungle’s population deserted to Calais’s hinterlands from which new jungles now emerge in the cycle of things. Third, the containment of the Jungle. As a collectivization of the stateless by the state, the Jules Ferry Jungle was as much a refugee camp as Guantanamo was a prisoner-of-war camp. Both misnomers depended on carefully thought out legal and territorial outsourcing that placed its humans in limbo, out of the law’s reach. Simultaneously this was augmented by investing millions in securitization through Le Touquet accord that keeps the British border on the French side of the English Channel. Jules Ferry marked the radical transformation of Calais with fences, walls, electrification, cameras and an extensive policing regime paid for by the United Kingdom. The stateless of Calais, the humans who had come with somewhere to go (the UK) became the humans with nowhere to go. The Jungle became a human dam. 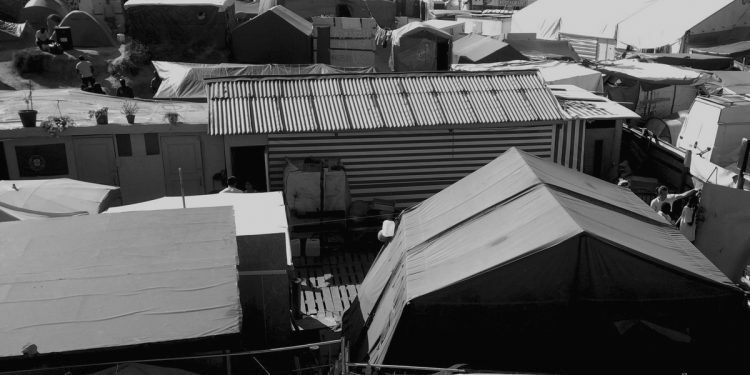 As a place of habitation it was accorded a “tolerated space” designation, a legislative no-man’s land that excluded the involvement of established refugee relief organizations like the Red Cross and UNHRC as at Calais’s former Sangatte Camp. Fourth, the place of civil agency. The legal indeterminacy of this new habitation created the space for radical voluntarism and direct engagement to take the place of institutional relief agencies. The spectrum of civil involvement exploded. From self-funded initiatives like A Home for Winter to school kids in the English shires and northern city suburbs donating pocket money. All these initiatives aggregated. Through this shared agency, the stateless of Calais had the resources to create a “vernacular” of the Jungle — a social architecture with its communal resources, churches, mosques, libraries and so on. New entities like L’Auberge des Migrants and Care4Calais carried out complex logistics of collection and distribution across multiple countries. None of this was planned or foreseen but it showed the extent to which a workable conception of “community beyond borders” was already in the fabric of society. Through the aggregation of civil agencies, the Jungle became a transformed subject, a broader political project as community. A community that in spite of its size, diversity and destitution, never fragmented or sunk into inter-communal strife. It was this broader project that was as much the target of the French and British states. Fifth and last, the subject of community as resistance. How could this complex social formation with ten thousand people be dispersed without a fight? Counter-strategies by the state — strategies that included the clearance of half its area, a ban on wood for the construction of shelters and repeated attempts to close down the cafés and communal spaces — condemned the Jungle to a struggle against internal collapse. Then, alongside the ultimatum of demolition, came the promise of a suspension of the Dublin Regulation (the forced return to the first point of entry into Europe) for those who chose to relocate voluntarily to officially sanctioned centers (CAOs). The bait to leave was the offer of asylum outside the straitjacket of the Dublin Regulation. In its last month, legal advisers thronged the Jungle moving between its schools, restaurants, surgeries, but all the while the daily administration of tear-gas and rubber bullets never relented. In all this, the autonomy of community through which the Jungle demarcated itself from managed refugee camps and refugee centers survived to the end. The Jungle at Jules Ferry — a site so vital to our understanding community in displacement — emptied without a fight. Instead we had the prime-time spectacle of Europe’s stateless, with their color-coded wristbands and their donated shoes and wheelie suitcases, being bussed off to shelters at arbitrary color-coded points on the map of France. Children remained stranded as administrative processes lagged behind the speed of demolition. During the evictions of past disparate jungles there was the legal recourse to reclaim confiscated tents from the authorities — the tent being the most significant of possessions for the dispossessed. (The absurdity, as ever, that private property rights prevail over all other rights of the stateless human.) At Jules Ferry such rights had become meaningless. As Jules Ferry was emptied by the busload, the images of tents ablaze swept through media networks. These images were read as gestures of symbolic defiance as this incarnation of the Jungle died.